If, while taking a walk in West Annapolis, you’ve spotted a large eggplant statue, then congratulations, you have found Evelyn’s. Just opened last year, Evelyn’s is a unique eatery that provides locally sourced, fresh ingredients in its meals for an affordable price. Inside, paintings of flowers adorn the gray walls, and more flowers are set on every table, providing an extra touch of comfort. The lively, warm atmosphere is enhanced by the light buzz of chatter from the patrons. A pleasant hostess seats people with a smile, calling them “dear” as if she has known them for a long time. From the bright, busy, kitchen the smell of freshly made pancakes wafts through to the dining area. Server Philip Miles gathers hot breakfast from the kitchen. On the wall, a chalkboard decorated with floral vines welcomes customers and provides more information about the restaurant in swirly handwriting: “At Evelyn’s, we are committed to a ‘plant to plate’ mentality. We will strive to source locally (when possible) by working with farmers in our community to provide the freshest ingredients possible.” This principle was a prominent motivator for the restaurant’s founder, Brandon Stalker. “Everything we do here is local,” he says. “It’s locally sourced food, local artists . 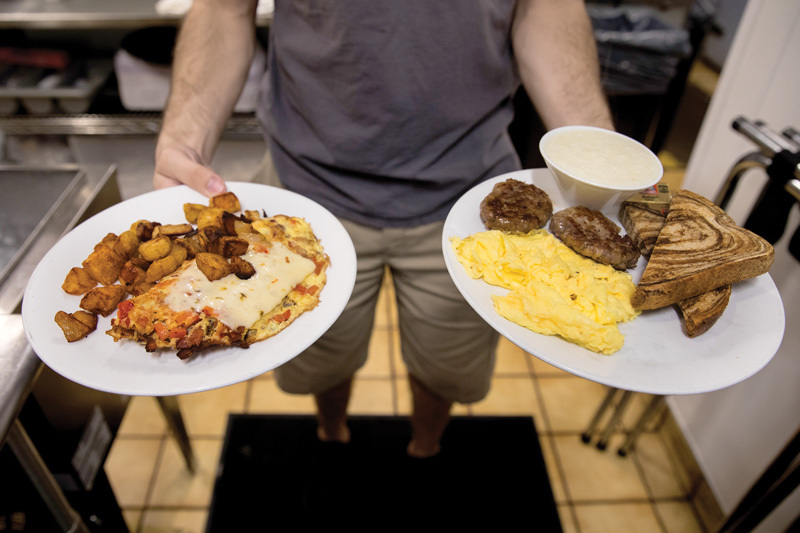 . . there’s plenty of stuff right here to be able to supply what you need.” A resident of Annapolis for nearly all of his life, Stalker aims to make this restaurant a haven of sorts for the locals. Another of Stalker’s aspirations was to create an eco-friendly, sustainable restaurant. All ingredients are set in a crop-rotation system, which is healthier than attempting to grow the same crops year-round—a practice that may rely on more chemicals and energy. The restaurant also makes an effort to recycle as much as possible and minimize waste. Anything that does not have to be powered electrically is powered with natural gas. These efforts create an environmentally conscious eatery that may benefit both patron and planet. Stalker began forming the idea of Evelyn’s about six years ago, while helping at Caroline’s Cakes. There, he discovered his interest in the restaurant business and one of the biggest rewards in the trade, “[The] instant gratification of watching people enjoy your food,” he says. Stalker strives to make his menu, prices, and policies accessible and open to everyone. The breakfast and lunch menus include everything from quiche to burgers, with many gluten-free and vegan options available. The food is high quality and the most expensive item is 15 dollars. The children’s menu is well developed, inspired by Stalker’s two children. Server Lindsey Smith stops to visit with Evelyn’s customers. One of these children is six-year-old Evelyn, who often proclaims that this is her restaurant, “My dad just manages it,” she explains. She occasionally tags along with her father and helps out around the shop with unabashed excitement. 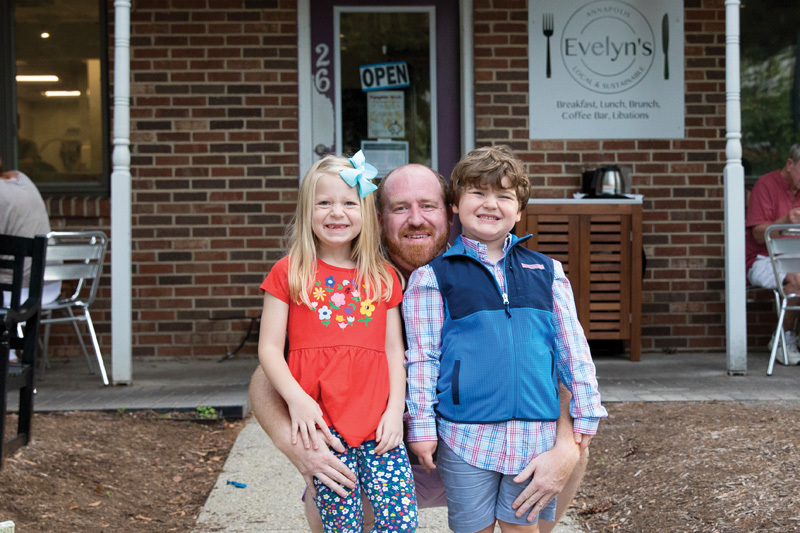 While mom-and-pop establishments have been dwindling over the years, Evelyn’s manages to preserve the wholesomeness of a small, local business with familial energy. Supporting other local vendors is of great importance to Stalker, especially the artists. He loves art, and displaying the paintings and sculptures from artists around the area seemed like a natural course of action. Along with the eggplant, several asparagus stocks sprout out of the ground in front of the restaurant, and a large pear stands on the corner of Giddings and Annapolis. Viewers are often amused by the creations, hand built by Jan Kirsh, and stop in to inquire about them. Visit evelynsannapolis.com to learn more about the Evelyn’s experience. Server Jen Dollar (left) and owner Brandon Stalker wait for lunch orders at Evelyn’s on September 26, 2018. Owner Brandon Stalker chats with a customer during the lunch rush on September 26, 2018. Server Lindsey Smith (left) visits with customers from the kitchen during the lunch rush at Evelyn’s. Susan Noyce from Agriberry Farms delivers fresh jam to Evelyn’s owner Brandon Stalker. Sisters Chris Burnett (left) and Sally Johnson visit over lunch on the patio at Evelyn’s on September 26, 2018. A regular at Evelyn’s, Tracy Hoover (left) chats with manager Autumn Scheeler. Owner Brandon Stalker and manager Autumn Scheeler talk in the kitchen in the early morning of October 8, 2018. Evelyn’s owner Brandon Stalker accepting a curbside delivery from Susan Noyce of Agriberry Farms on September 26, 2018. 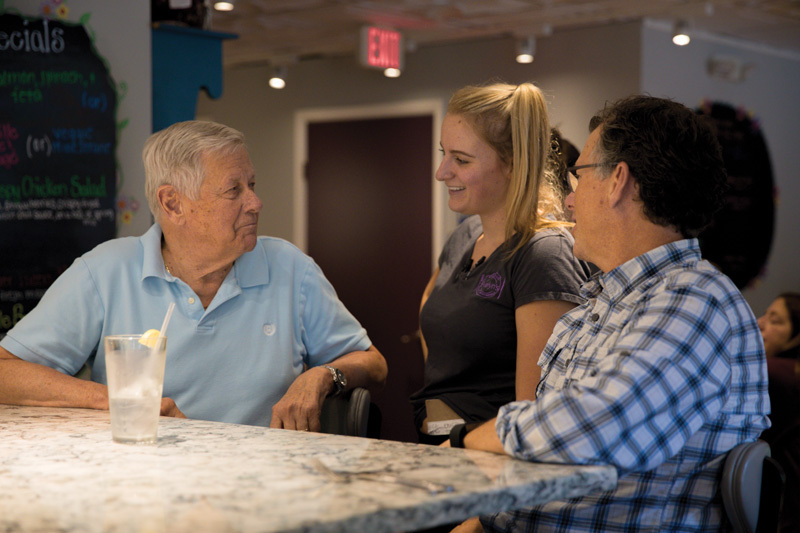 Server Lindsey Smith (center) chats with customers during the lunch rush at Evelyn’s on September 26, 2018. Server Philip Miles gathers hot breakfast to serve to customers at Evelyn’s on October 8, 2018. 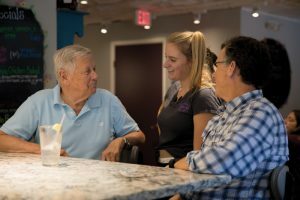 Jen Dollar (center) serves lunch at Evelyn’s on September 26, 2018. Customers visit after breakfast on the patio at Evelyn’s on a Monday morning. Michael and Evelyn help their father, owner Brandon Stalker, at the register. Owner Brandon Stalker takes a moment to eat breakfast with his family. Evelyn’s cook Jairo Lucrio hustles in the kitchen during the Wednesday lunch rush. Server Philip Miles (left) chats with a customer at the counter as guests enjoy breakfast in the dining room at Evelyn’s. A welcome sign greets customers in the dining room at Evelyn’s. Error: Error validating access token: Session has expired on Saturday, 09-Mar-19 15:57:50 PST. The current time is Friday, 19-Apr-19 11:29:22 PDT.